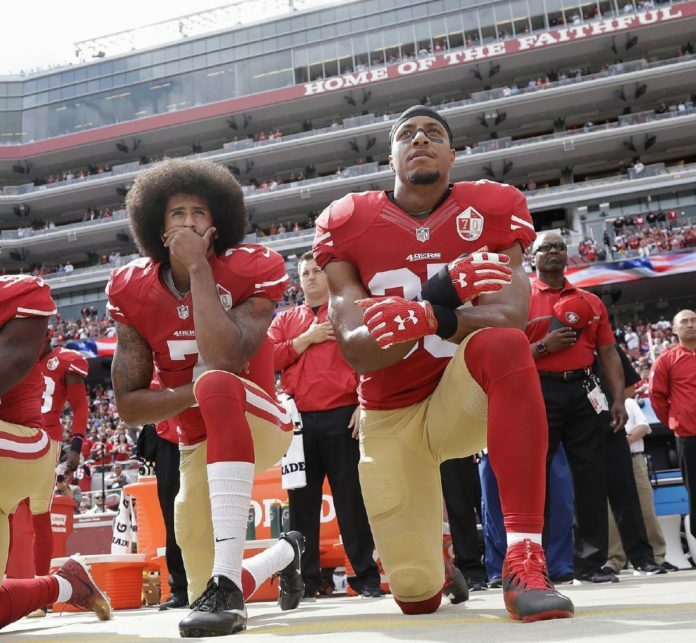 In this Oct. 2, 2016 file photo, San Francisco quarterback Colin Kaepernick, left, and safety Eric Reid kneel during the national anthem before an NFL football game against the Dallas Cowboys in Santa Clara, Calif.
Today’s column isn’t one that J-School 101 profs will add to their freshman must-reading lists for its mastery of our craft’s essentials: The Who, What, Where, When, Why and How. Here at the intersection of politics and sports, we are dispensing with all that and instead we are road-testing the three essentials of the lesser-valued craft of punditry: The What-If, What-Would, and Why-Not. WHAT IF? While recently watching President Donald Trump again declare his contempt for athletes who took a knee during the national anthem to protest police abuses and shootings of black Americans who apparently hadn’t threatened officers, I began thinking about what might have been. What if Colin Kaepernick, the former San Francisco quarterback (who now has no National Football League job), had chosen a similar yet different way of protesting? What if he and other players (most of them black) hadn’t knelt on just one knee (some placing their hand or fist over their heart; others raising a fist)? What if, as the anthem began, players with strong religious beliefs had knelt on both knees, hands clasped in prayer? What if these religious players later explained they were praying to God — maybe asking Jesus Christ to show America’s police there are other ways to handle these tense situations? What if those religious, yet also patriotic, players explained they understand cops can become stressed — and yes, frightened — in confrontations with people who might have concealed weapons? But that was why they were praying to God to guide America’s leaders and enforcers on the streets to do better jobs of defusing tensions, not enflaming them? WHAT WOULD? Ever since Kaepernick led the league in raising consciences, I have wondered how Trump would respond to a protest that was patriotic and faith-based — yet still fervently supporting black individuals who have been abused and shot by police. What would Trump now tell his faith-based loyalists — that he’d shout at players who dared to kneel and pray during the anthem of our one nation under God: “Don’t pray or you’ll get no pay!”? And mainly: What would be the response of Trump’s most patriotic and fundamentalist voter base? Would at least his faith-based loyalists realize that America urgently requires leadership that will lead us back to becoming a more united nation? Timing is all: We know why Trump is erupting in his outbursts of intolerance (masked with fake-patriotism). This is Donald’s Diversion from what is really driving him crazy. As special counsel Robert Mueller has moved into the final stage of his probe of Russia’s bid to sabotage America’s democracy, Trump increasingly punches his red-white-and-blue panic button — hoping to divert America’s attention to anything else. But Putin’s plan is to destabilize our democracy was based upon just one thing: getting Americans fighting with one another. That’s why Russia has been infiltrating our social media, planting fake stories that the Trumpers would retweet. Also using organizations including the National Rifle Association to get Americans fighting with other Americans. Enter Trump. Intentionally or maybe (in his best defense) ignorantly, Trump played right into Putin’s string-pulling hands. Trump even did the one thing Putin couldn’t: He shattered democracy’s bedrock by getting Americans to distrust their own news media. But this is one of those rare times in history when the facts line up to lead us to our urgent solution. WHY NOT? Senate Majority Leader Mitch McConnell (see also: The Case of the Shell-Shocked Tortoise) and House Speaker Paul Ryan (see also: Stan Laurel, Ed Norton, Marcel Marceau trapped inside his own glass box) both have one last chance to salvage the vestiges of their limp legacies. Why not meet beneath the Capitol dome at midnight and plan one Hail Mary effort to rescue the national cohesion their president shattered? Why not try to resurrect the values the world always admired as our formerly-United States? Why not try to put Uncle Sam together again? Martin Schram, an op-ed columnist for Tribune News Service, is a veteran Washington journalist, author and TV documentary executive.